In the summer of 2016, Gabrielle was back to asking people for guided tours. This time in Jamaica, Queens, as part of her summer residency at No Longer Empty’s Jameco Exchange. The linkages across space, even in one city, were significant–and were echoed by where Jamaica residents would in fact, take someone on a tour. While Jamaica Ave got a lot of love, locales also ranged from the local pizza place to Paris, France. Lower Manhattan, going home to Rhode Island, or to the small town in Minnesota visited just once, also figured significantly in this imagined geography. Intersection | Jamaica built on a much earlier work, Playground, in which Gabrielle asked people in East Harlem the very same question in 2002. One of those people had said he’d take her to Jamaica — and finally, in 2016, she got there. I’d take you to Jamaica, Queens. 165th Street. I didn’t go to Jamaica Queens until I was like fourteen years old. But, Jamaica Queens is like home to me. Still, everybody there knows me, the people haven’t changed much. We installed almost 20 Intersection|Prospect Heights popup exhibitions in everyday places all around Prospect Heights. These included the supermarket, the library, the hardware store, dry cleaners and bars, among other places. One of the highlights of the project was forming relationships with these businesses and the ways that they came to host the project, and in many sites, to really support it, look out for it, and feel proud of it. Met Food. The place that kept me going in my research, which David told me “talks more about the sense of community” than anywhere else, and the place to which I was most thrilled to see these stories and photographs brought back, almost 15 years later. Frank and Abdul, community-builders, and incredibly supportive people in this project. Not to mention hosts who on our guided tours provided all participants with bananas. Amazing. Kimchi Grill, where our neighborhood stories were right next to another essential – hot sauce. COLOR Bklyn. They shared their last months on Washington Avenue with us, and valiantly put the project out on the street everyday, protecting it from wind and rain, and helping us to engage people passing by on the street. The legendary El Gran Castillo de Jagua – even in its new location, still a major community landmark, and one of the most popular popup exhibitions. Brooklyn Public Library. One of the most wonderful parts of this project was working with BPL, and finding all the synergies between Intersection and all the amazing initiatives going on at BPL – from the Brooklyn Transitions series to the Brooklyn Collection to Our Streets, Our Stories, and beyond. The installation above was in the Central Branch’s children’s room, where we got some of the most heartfelt stories contributed, including the one below. The process of bringing Intersection | Prospect Heights to the public from in-depth research, a new idea, a launch and finally an amazing three-month long experience, was truly a highlight of 2015. There’s much to say on the kinds of experiences we had and the kinds of conversations we were privileged to be a part of, but for now – we thought you’d like to see a little of what the process of bringing the project to the public was like. A few of our favorite moments of making it happen, in pictures. Reconnecting with our tour guides from 15 years ago. Here Mike Halkias of the Usual reads his own guide, and remarks on how much more hair he has in the cover picture. Receiving the printers proofs for all six of our guidebooks – seeing them all together finally, in living color. Holding the dummy proofs in our hands – feeling what the guides might really feel like – one of the best days of 2015. The guides and pop-up exhibitions come together – with places for people to leave their own stories. Thrilling to bring one of our very favorite images back to the neighborhood. We’ve loved this boy since Gabrielle photographed him at the Conrad McRae basketball tournament at the Dean Street playground in 2002. Installation began at Brooklyn Public Library – and shortly after setting down our first pop-up, it was so gratifying to see this man be the first to pick up a guidebook. Once people started to pick up those guides, the pop-ups needed to be refilled regularly – much to our delight. While the installations at BPL and Met Food needed to be refilled most often, all of the locations required our regular trips around the neighborhood with the artists’ best friend, a shopping cart. Public art is glamorous – and we were happy for a very mild autumn! Last year we released 168 – an app that helps you track, balance and be more mindful about how you spend your time. Now, we’ve taken that concept further, and into a new medium : introducing 168 Paper! While we love the app, we realize that sometimes the very act of taking out our phones distracts us. Sometimes what we need is to simply write things down. 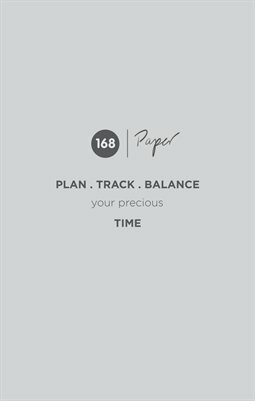 168 Paper is a pleasure to hold, use and write in – it allows you to plan your days, track your time and make sense of your week in an easy-to-use, notebook. Its pages let you track 2 weeks of time. 168 paper is a print on demand book you can buy here. Find more at the 168 website. If you buy the book or download the app we would love to hear your thoughts. If there were one thing that talks more about this community than anything else, it’s probably the supermarket, you know? Because of the people that are there and what they try to do. They do it to make money, granted, but they do it because they seem very happy to be here…concerned about people, concerned about delivering service to the neighborhood–to the whole neighborhood. It’s not that they came in and decided, ‘Oh, we’re getting rid of the Goya stuff here, you know? We’re going upscale.’ No. Still got ham hocks there. It’s what made this neighborhood for us. 25 years ago we got very lucky on the house, but really it’s the fact that it’s a comfortably mixed neighborhood. Now… I can’t pull down my veil of ignorance… Yeah, I’m part of the dominant society, but it just feels to me like a comfortably mixed neighborhood. In 2001, I began a project in Prospect Heights, Brooklyn, which I called Guided Tours. 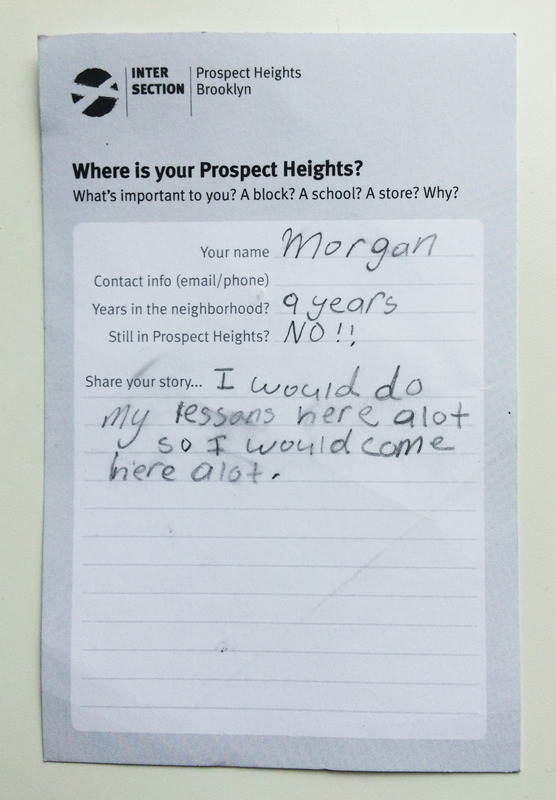 In this work I asked neighborhood residents to take me on tour of “their” Prospect Heights. I was interested in understanding people’s experiences of their everyday neighborhoods, and had a feeling that within very common spaces very complex ideas about identity, neighborhood and the world were getting worked out. That work became the basis for my dissertation, Guided Tours: The Layered Dynamics of Self, Place and Image in Two American Neighborhoods, and for journal articles in Space & Culture and Society & Space, as well as spurring me to ask similar questions in a neighborhood across the country, in Oakland, CA. In this work, I considered the powerful potential for dialogue through photographs of the everyday, and how bringing people’s everyday worlds back to them might allow them to see those spaces in new ways. Now, I’m returning to this body of work to think about how an archive of the everyday from more than thirteen years ago might help the community talk about the incredible gentrification and change (not least due to the Atlantic Yards / Barclay’s development) that has happened in this neighborhood in the intervening years. I’m beginning this process by making a selection of the work available online, and through a series of forthcoming blog posts as a way to think about this archive in new ways. As a start, above is a photograph of Met Foods from 2005, with a thought from one of my tour guides that explains how a supermarket might help us begin to talk about the complexity and detail of gentrification and housing segregation in New York. See the selected archive online : Guided Tours : Prospect Heights. The piece was about our projects, temporary and permanent memorials, and how to continue ephemeral work – and whether this is an oxymoron. Stay tuned for new and ongoing versions of this ephemeral-archival work.